I always wondered how it would be if a non-Lubavitcher translated Tanya. I can't imagine a reading ot Tanya divorced from its environment of thousands of volumes of Chabad literature that build on it and explicate it. I was struck to recently learn that Otzros Hachochma offers a optional Chabad module that can be added to its database - seven thousand volumes. 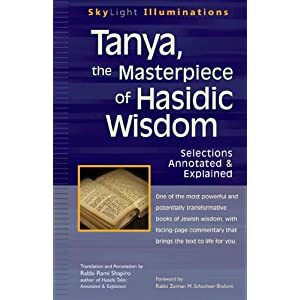 On the other hand, there have been many Chassidic Rebbes and even on-Chassidim who studied Tanya and did not study its surrounding literature. But a translation of Tanya by Reform Rabbi! Who would rush in where angels fear to tread? Now Rami Shapiro did it. Is it a New-Age take on Tanya? I had not read it and can't comment but perhaps one of the readers of this blog can share an opinion. "Tonight is Erev Rosh HaShanah, the beginning of Judaism’s Ten Days of Awe that end at sundown on Yom Kippur. Millions of Jews will undoubtedly go to synagogue during this period. I won’t be one of them. My reason for not going is simple: I find the experience unfulfilling. When I do participate in conventional Jewish prayer I find myself arguing with what I am reading. I don’t relate to the metaphor of God as father, king, and lord; I don’t believe that God is in control of my life; and I find the medieval worldview of the machzor (High Holy Day prayer book) incompatible with what I know to be true about life. So rather than sit and complain, I stay home. I will spend most of tomorrow morning walking in the woods by the creek near my home. I will chant and pray and talk with God, allowing that the Infinite All can manifest as a finite One with whom I can meet and dialogue. I will spend the afternoon studying Jewish texts: Proverbs, Ecclesiastes, and Job for these are the books that speak to me most powerfully. In the evening I will gather with my family to renew ourselves as a family, and to share our thoughts about where we are as a new year unfurls. During the intervening days I will seek forgiveness, humbling myself until I flow like water into the low and narrow places within me that need watering that the seeds of holiness trapped there can expand and grow and shatter the narrows, and experience and share the spaciousness of love and forgiveness. And I will give tzedakah (monetary donations) to help those, both human and canine, whose lives are bleak and broken. I will spend Yom Kippur: fasting, walking, praying, and studying. And I will do so alone. I have community in my life, but I find that this time of year is best met alone. That’s just me. But if I were a rabbi of a community, I would no longer ask them to dress in restrictive clothing, sit in a windowless room breathing stale air, and reading old books. I would invite them to wear lose clothes and comfortable shoes, and to walk with me beside still waters, to lay with be in green pastures, allowing the rustling trees to be our liturgy, and the chirping birds to be our cantors, and the babbling brook to be our rabbi teaching us to walk the watercourse way of humility, justice, and compassion. So for all those who choose not to attend synagogue, know that you are not bad or disloyal or even alone. Honor the holy days in whatever way allows you to deepen your humanity. And may you in this way find blessing, sweetness, and peace this New Year. Do not say something cannot be accepted (heard) for its end is to be accepted(heard). Hillel continues. He now says something obscure. There are a number of textual variants and many explanations of this phrase, all of them teaching important concepts but all having the ring of something which is being read into the words and not its intended meaning. Rambam curiously says that it means that a teacher should not say something outrageously non-sensical with the intent that the student will realize that it is non-sensical and figure out what the teacher really meant to say. I call this a curious explanation because in a number of places, one of which is the Introduction to Mishna Chelek, Rambam says that this is exaclty what Chazal do in their aggadic statements - veiling deep teachings in statements that are so patently impossible that any men of knowledge will be led to discover their true meanings. Here he says that one should not do so! Perhaps Rambam would agree that a riddle is a valid means to teaching but an allegory is not. Others say that this passage refers to keeping secrets or not expect that a fact shared will remain private. Others explain it to mean that one should not dismiss any Torah teaching but try to justify it and discover its intended meaning. I would suggest that HIllel is warning us that the coming changing paradigm of individual religiosity that overshadows traditional communal religious expression will bring with it many new ideas. People are all different and multiple new expressions and religious formulations will soon arise. In fact, as we know, the hundred years after HIllel were a time of great ferment and many new ideas arose in the Judean religious marketplace. Chazal accepted and supported some of them and negated and fought publicly the others. HIllel says: "Do not dismiss any of them, for even if some of them seem so far from the mark, so distant from what has been taught under the old paradigm of Tradition, so novel that you think they will never be accepted, some WILL be accepted". Therefore treat them seriously. Investigate them, search them out, consider their implications and where they will lead. If they are consistent with Torah and raise the honor of Torah and its Giver, watch closely as they spread and be prepared to guide their proponents and influence their uptake. If, on the otherr hand, they are destructive and heretical be prepared to oppose and fight them. But never, never simply dismiss them. Can G-d do something that he cannot do? For example, can He construct a triangle that does not conform to the Pythagorean theorem? Or, to put it in different way, can He create a rock so heavy that He cannot lift it? This question concerned medieval philosophers. A good discussion of the Jewish sources on this topic can be found in Ohr Hatorah Tzemach Tzedek Vayikra 3, 888 and Sefer Ha Chakira p. 68. Tsemach Tsedek explains that the Rashba (Teshuvos I:418) says Hashem can supercede all limitation while Rambam and the Yosef Albo in the Ikkarim say Hashem is constrained to the rules he makes for the world. To be Omnipotent is to be abel to do anything which is possible; inability to do that which is impossible in no way diminishes G-d's Power. Ralbag in Milchamos Hashem, Part III says similarly that G-d does not have knowledge of what humans will do with their power of Free Choice but that in no way diminishes His omniscience because to be Omniscient is to know all that can be known but the future actions of autonomous human beings simply cannot be known. Rashbo's view can be understood by resorting to the analysis from Sefer Mamarimof the Rebbe Rashab מאמרי אדמו"ר הרש"ב - מאמרים תרמ"ו-תר"ן עמוד 274 where he explains that there is an upper and lower level to this mathematical understanding and Rav Yosef Albo was only perceiving the lower level. Yes, on the "lower level" the Pythagorean theorem is supreme but on the "higher level" it is superceded. An example that Rebbe Rashab uses is the paradox of the aron in the kodesh kodeshim which had measurements but took up no space. Pythagorean theorem reigns in Euclidian geometry but is surpassed in non-Euclidian geometry and Eistein's work. Something similar can be said also of how humans serve Hashem. Previously, we expounded upon the avodah of "running and returning" . There is a balance between two opposing forces that defines a person's avodah in life. This week's parashas of Nitzvaim "Standing" and Vayelech "Going" represent a contradiction. How can one stand and walk at the same time?! So indeed, it is possible to serve Hashem on two levels at once, outwardly contradictory but in truth consistently. Nitsavim;Vayelch teaches us that it is indeed possible and desirable to do so. P.S. In today's world that all of the Rebbeim and Rishonim did not see, may people go nowhere on a treadmill while hooked up with WIFI to everywhere in the world while multitasking on everything. Indeed while some think that this is the fullfillment of the Omni-life, others think the cognitive dissonance leads to nothing really being created. Ben Sira 5:3: Do not say, "Who can overcome my power", for G-d seeks out the persecuted. As you may know, I work for a very special organization in Monsey called Yedei Chesed which provides numerous services to individuals with developmental disabilities and their families. We have entered a contest via the Pepsi Refresh Project attempting to win money which will enable us to provide psychiatric services to many of the individuals we serve. The voting takes place until the end of September and we need to get as many votes as possible. Please help us help the families we serve in our local community! 2. VOTE every day - vote under every email address you have. 3. Post a link on your Facebook page (or any other social networking account). 4. Forward this email to all of your friends, email lists (school, work, shul, community groups, etc.). I thank you in advance for all of your help and support.